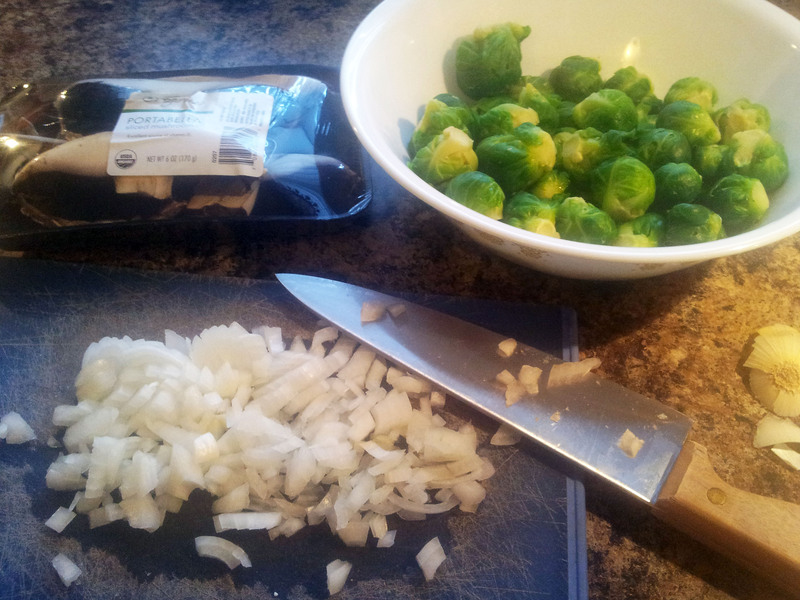 Myself, and a large chunk of the population, enjoy Brussels sprouts during the holidays. Now, did I always? Definitely not. I had tried them a few times and they just didn’t do it for me. 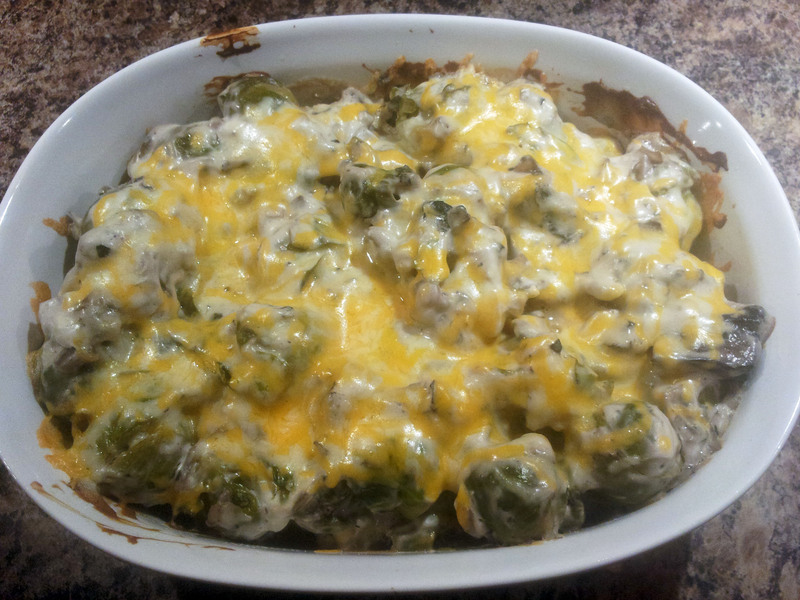 Then, about five years ago my mother-in-law made Brussels sprouts with cheese sauce for Thanksgiving. I put one or two on my plate fully intending to try one, but not expecting to like it. Surprise surprise, I did like this recipe and proceeded to eat the leftovers for the following two days. That Thanksgiving side dish has brought me to the following recipe. I ran across this one in my Taste Of Home Holiday magazine, circa 2008. I’ve made it twice, once for Christmas Eve and once for Thanksgiving. Both times I felt like it needed just a little something more. I was still in the “follow the recipe exactly” mindset back then though so I didn’t feel comfortable tweaking it. That’s not the case anymore. Since I had some fresh mushrooms that needed to be used I decided today was a good day to try it with some changes. That included using Portabella mushrooms, garlic, salt, and pepper. Not a big change, just a little tweak. I added the garlic, salt, and pepper to the mushroom mixture while it was in the frying pan. 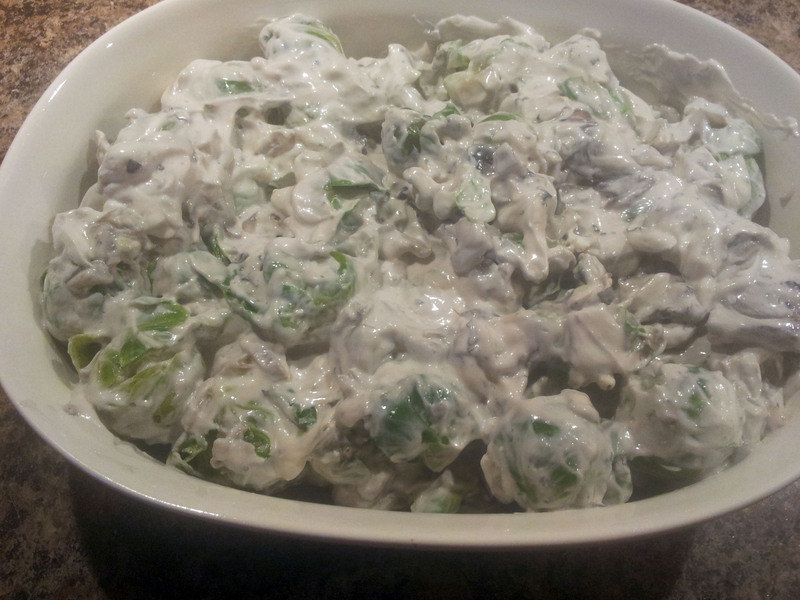 Then, that was added to the cream cheese mixture (which I added a little salt and garlic powder to). Next up, baking time. I added the cheese at the end, put it in for a little longer, and then we’re ready to eat. It looks tasty! Overall, I was happier with the additions. It’s a heavy side dish, so keep that in mind. I made it as a main dish for tonight and it was more than adequate. It’s a good recipe to keep on hand, but it still doesn’t beat the one that my mother-in-law made. I need to ask her if she still has that recipe!